Jaguar built some of the greatest sports cars in history, including the XK120 and E-Type, but in recent years the company has focused more on luxury vehicles. That changed at the New York Auto Show, when Jaguar announced that it would build a new sports cars, the F-Type. At the time, Jaguar had nothing to show but a video and some photos of a camouflaged prototype. Thanks to CAR magazine, we now have a sneak peek of the F-Type’s shape. CAR digitally removed the camouflage from some spy shots to reveal a svelte two-seat roadster. At its New York press conference, Jaguar said the F-Type would resemble the 2011 C-X16 concept car, and these renderings certainly do. The overall shape is very Jaguar, and details like the headlights, hood vents, and grille shape tie the F-Type to the bigger XK. The strip that runs across the grille is pulled from the E-Type, a subtle allusion in an age of retro carbon-copying. The vents that flank the grille, and the mess of lines around the rocker panels, may be a bit much. However, they give the F-Type a feeling of performance in the modern sense. New race cars are full of ducts and creases that improve aerodynamics. At this week’s Beijing Motor Show, Jaguar announced which engines would be powering the F-Type. Buyers will have three choices: a 3.0-liter supercharged V6 with 335 hp and 332 lb-ft of torque, the same engine with 375 hp and 339 lb-ft, and a 5.0-liter V8, which will have either 503 or 543 hp (a final decision has not been made). Jaguar did not say which engines will be sold in which markets, or whether the F-Type will be the first Jag in years to come with a manual transmission. 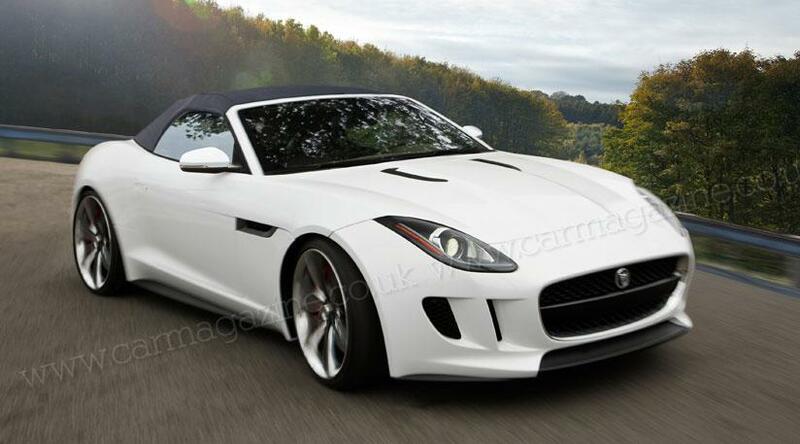 The F-Type’s chassis is an aluminum monocoque, so it should be pretty light. At New York, Jaguar said it was aiming for a 0-60 mph time of under five seconds, and a top speed of 180 mph. The F-Type roadster will go on sale next year, with a coupe planned for later. CAR reckons the F-Type will cost about 55,000 pounds, which would put it in competition with the Porsche Boxster and Cayman. The V8 version would make an interesting British alternative to the Corvette. However, the F-Type’s biggest competition may come from cars that went out of production years ago. When Enzo Ferrari was still a penniless mechanic, Jaguar was building the XK120. When that car debuted in 1948, it was the fastest car in the world. The E-Type is considered by many to be the most beautiful car ever made. Legend has it that, when Enzo Ferrari saw the E-Type, he decided to build the 250 GTO. With ancestors like that, the F-Type has some big shoes to fill. So far, the new car has a lightweight chassis, powerful engines, and attractive styling. It looks like Jaguar is off to a good start.